US Rep. Steve Scalise, the third-highest ranking member of the House, has denied that he knew an organization founded by former Ku Klux Klan leader David Duke was a white supremacist group before he spoke to them at a convention in 2002. 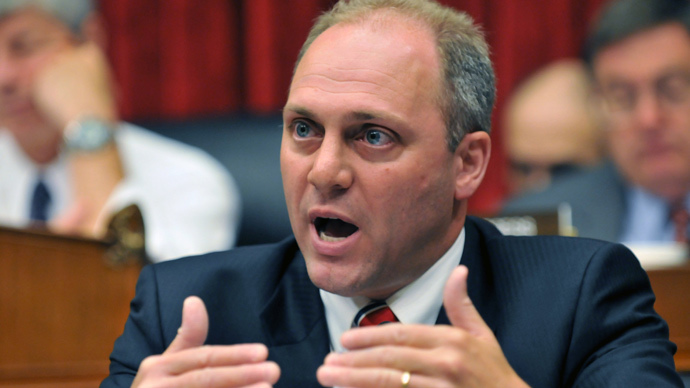 At issue is Scalise’s May 2002 appearance before a convention of the European-American Unity and Rights Organization,deemeda white supremacist group by the Southern Poverty Law Center. EURO was founded by Duke, a prominent white nationalist who was living in Russia at the time. Scalise, a Louisiana Republican, said that, in 2002, he was a state representative with only one staff member and that he would often speak in front of any group that requested his presence. He said he does not remember the event, but says if he did speak there - as was first reported by blogger Lamar White Jr. - he did not know the group was associated with Duke. "I don't have any records from back in 2002, but when people called and asked me to speak to groups, I went and spoke to groups. It was myself and [former state Sen.] James David Cain who were opposed to the Stelly tax plan,” Scalise told the New Orleans Times-Picayune, referring to a campaign he was a part of to defeat a measure that would have increased income tax in Louisiana. "I was the only legislator from the New Orleans area who was opposed to the plan publicly, so I was asked to speak all around the New Orleans region. I would go and speak about how this tax plan was bad." Scalise emphasized that he would appear before all kinds of groups that did not share his political or social views. "If I knew today what they were about, I wouldn't go,” he added to the Times-Picayune. “My staff, they are able to vet organizations. We turn down requests from organizations we don't approve of." “[I]t's insulting and offensive for anybody to insinuate that I would affiliate with a group like that,” he told the Times-Picayune. Yet Duke, who appeared at the convention via phone and video hook-up, said that Scalise was “friendly” with one of his own associates, Kenny Knight, who asked Scalise to appear at the 2002 conference. Duke, who said he cannot be sure if Scalise really knew “what the conference was,” added that Scalise did not seem to have reservations about addressing EURO. Duke said he did not have a relationship with Scalise and did not believe the current House Majority Whip “was one of us.” But Scalise did keep in touch with Knight, he said. Scalise’s spokeswoman, Moira Bagley Smith, insisted to The Post that the congressman just did not know of the group’s affiliations at the time. "Twelve years ago, I spoke to many different Louisiana groups as a state representative, trying to build support for legislation that focused on cutting wasteful state spending, eliminating government corruption, and stopping tax hikes,” Scalise said. "One of the many groups that I spoke to regarding this critical legislation was a group whose views I wholeheartedly condemn. It was a mistake I regret, and I emphatically oppose the divisive racial and religious views groups like these hold. I am very disappointed that anyone would try to infer otherwise for political gain. As a Catholic, these groups hold views that are vehemently opposed to my own personal faith, and I reject that kind of hateful bigotry. Those who know me best know I have always been passionate about helping, serving, and fighting for every family that I represent. And I will continue to do so." Rep. John Boehner (R-Ohio), the speaker of the House and the chamber's top GOP lawmaker, said in a statement of his own that Scalise has his "full confidence."